In this day and age it’s not a simple task to find freshly made charcuterie of any kind, much less Weisswurst, a traditional Bavarian sausage made from very finely minced veal. Once again we are lucky to have The Smokehouse of The Catskills, only a few miles from home. We are assured that every Thursday of every week Bavarian specialties have been hand-made and on display. This Rip Van Winkle region of the Catskills had a significant population of Dutch and Germans. This resulted in the original association that started the Smokehouse in 1945. Lucky for us it’s still going strong. 1. In a large, enameled cast-iron casserole, heat 2 TB of the oil until shimmering. Add the bacon & cook over moderately high heat until the fat is rendered & the Bacon is crisp. Using a slotted spoon, transfer the bacon to a paper towel–lined plate. 2. Add the Onion to the casserole, cover partially & cook over moderately low heat, stirring occasionally, until very soft, about 20 minutes. Increase the heat to moderately high. Add the Wine, Apple, Juniper Berries, Bay Leaves, Sugar, 1 tsp of Kosher Salt & 1/2 tsp of Pepper & boil for 3 minutes. Add the water & the Sauerkraut. Reduce the heat to low, cover & cook until the Apple is very tender, about 45 minutes. 3. In a large deep-sided saute pan, add water. When it starts to boil, add the Weisswurst & simmer them until they have heated through, about 8 minutes. 4. 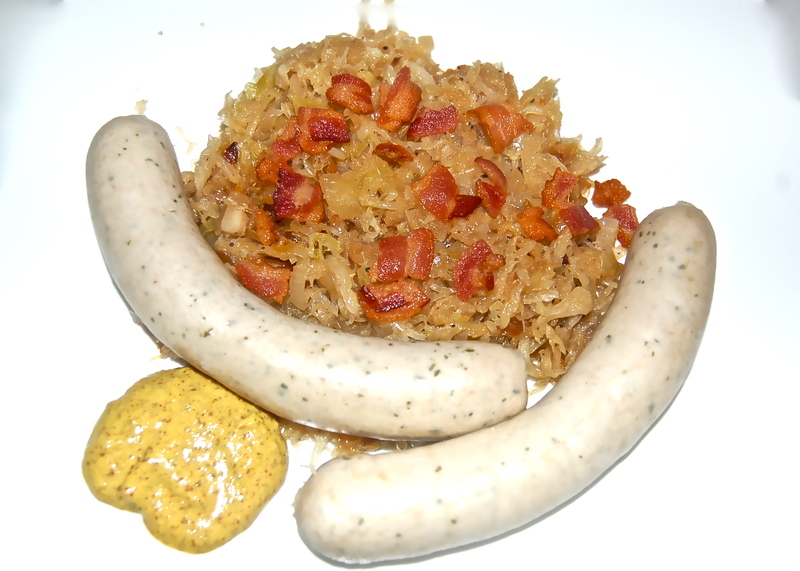 To serve, spoon the Sauerkraut onto each plate & arrange the sausages around. Sprinkle the reserved Bacon over the Sauerkraut & serve with a large dollop of Mustard.